The AeroVee Engine is air cooled, and is designed to work in conjunction with cooling baffles. 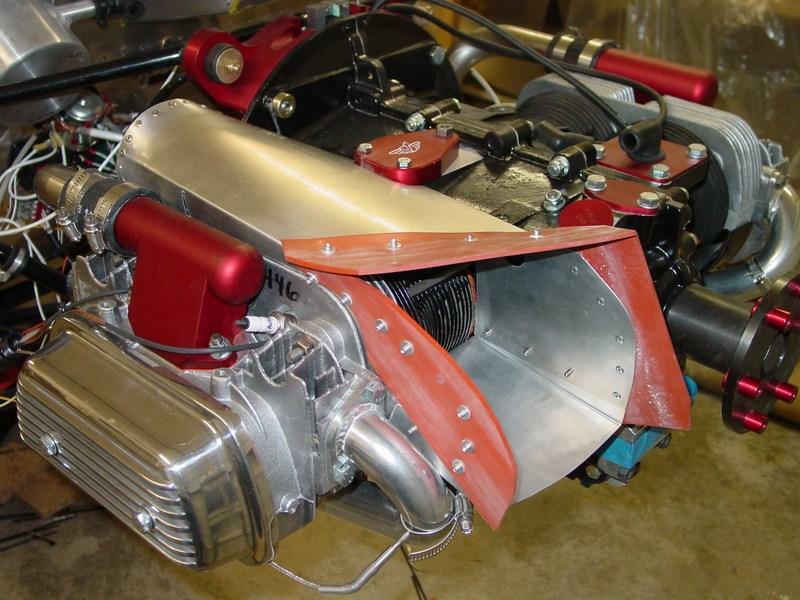 The Engine comes with a sheet metal shroud "Super Tin", so the baffles that need to be constructed are for the tops of the cylinders to form the baffle boxes, and the lower baffle across the crankcase bottom. The lower baffle also directs cooling air into the oil cooler. 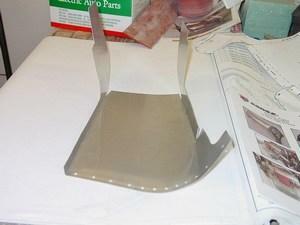 The AeroVee installation manual includes full size templates for the baffles. These templates are fairly good, but they definitely require some hand fitting and "tweaking" to fit just right. 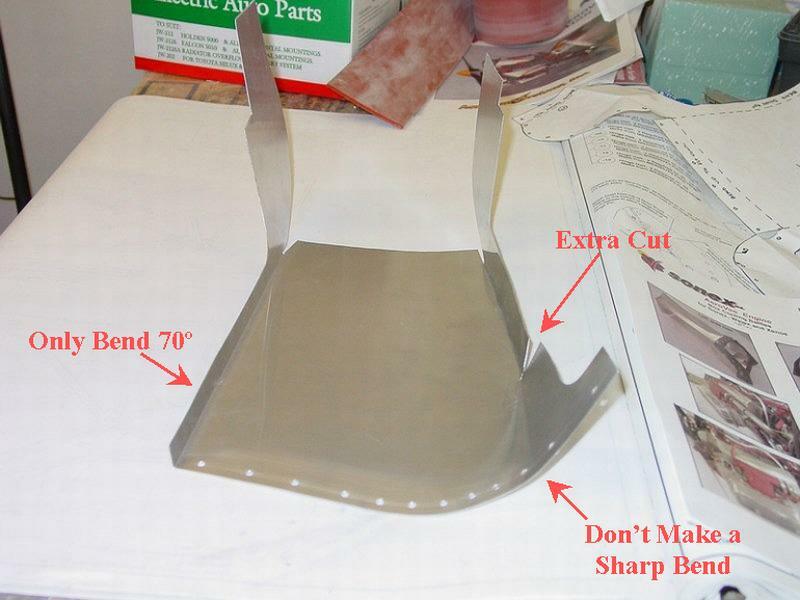 The side baffles start out making the baffle top. 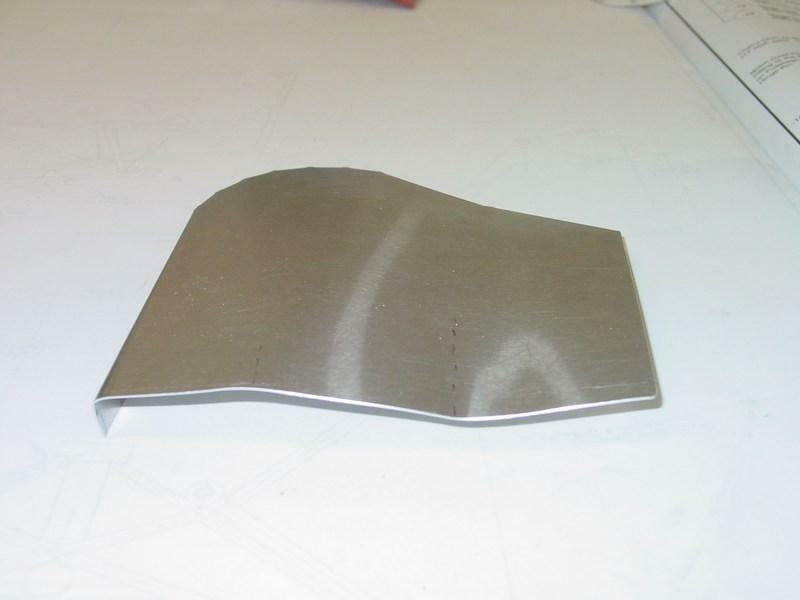 The edges of the top are bent down, and the aft end is bent into a cone shape where it will connect with the end plate. 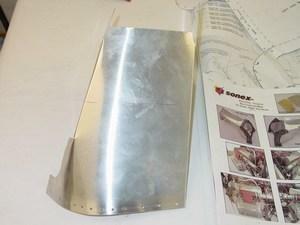 Here, the baffle is shown upside down. The supplied templates did need some tweaking, but were actually very close. If you had to make these from scratch, it would be a chore! 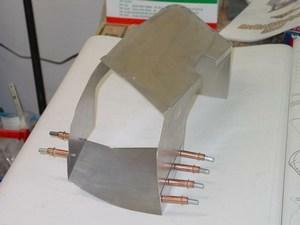 Top view of the same baffle. End plate. It is bent a bit at the bottom to follow the contour of the super tin. The end plate will for the back side of the box. Here is the right side baffle assembled. 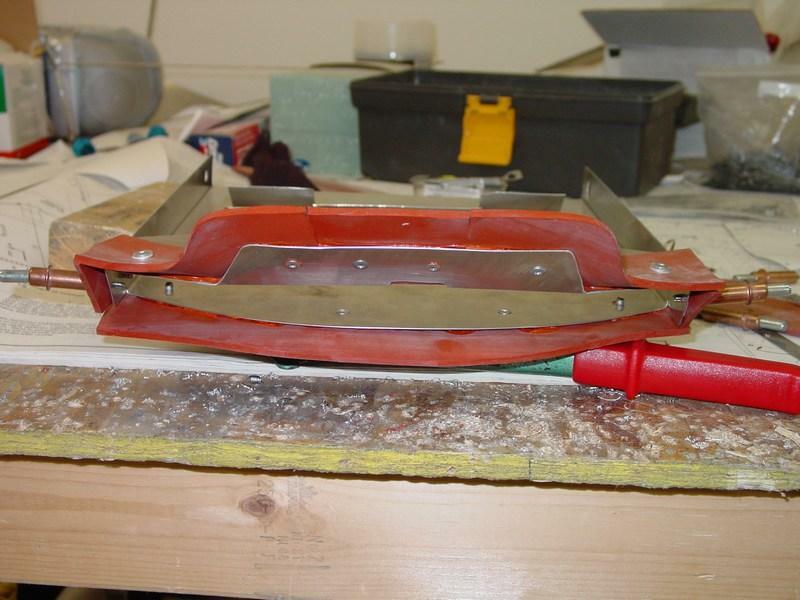 It has the front floor clecoed in place, and the end plate riveted in place. The baffle has been fitted with the rubber seals, and installed onto the engine. 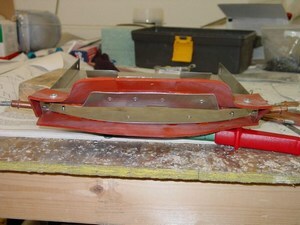 It fits down into the cooling fins, and makes a tight fit and pretty good seal. A single sheet metal screw is used for added security. All the rubber seal are riveted in place with aluminum washers and rivets. 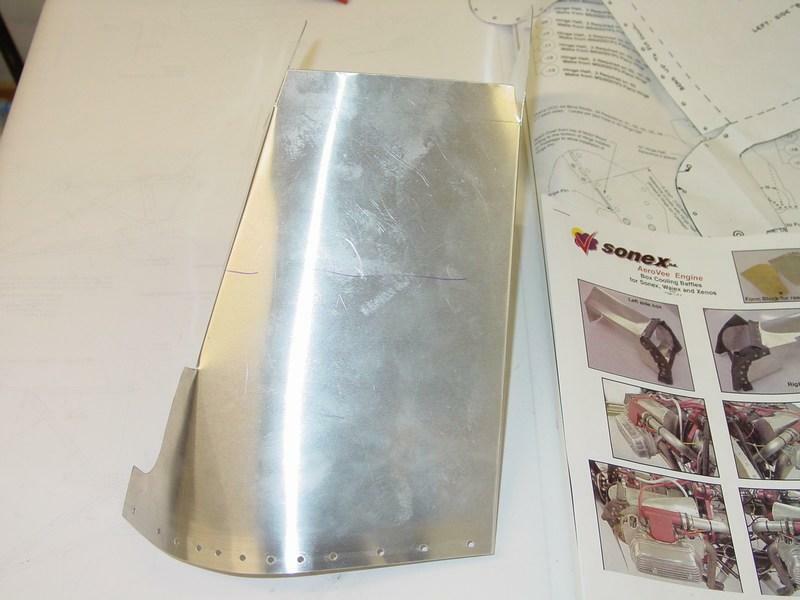 The lower baffle is also bent up according to the supplied templates. The fit was pretty good, and matched the cowl profile nicely.